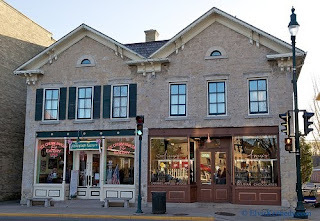 On Saturday we went to Cedarburg. 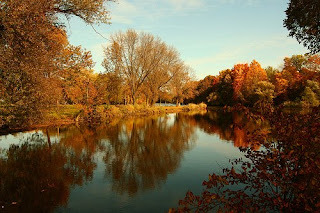 Cedarburg is an small, old American town that is just so pretty. It has been "tourististified" but that really doesn't detract from its charm. There is an old mill which has become a winery downstairs and then various little shops on the two upper floors. There is also a little cafe in there but we have found that expensive in the past. There is a beautiful river and just one main street to walk down. We always seem to go to Cedarburg in the winter and shiver up and down that street very quickly. It was a pleasure to stroll along it on Saturday, nosing into all the little gift, candy, garden and antique (or as Philip calls them "old toot") shops. We stopped for a cup of the best iced coffee ever,as it was a little warm, and then made our way back to the car. Alan likes to visit Cedarburg when he is here so, now I think of it, that is probably why we usually go in the winter. On the way back I saw something on the road ahead. At first I thought it was an old rag or a piece of junk but then I thought I saw it move. Oh....oh........a "Major Tom" moment was approaching. Do let me know if you haven't heard the Major Tom story and I will recount it on here. I just don't want to bore those that have heard it many, many times. As we drew nearer I saw that the thing in the road was a huge turtle. A huge, slow, determined turtle who had made it to the middle of the road but looked highly likely to get squished any minute. I was having heart failure every time a car just missed this poor creature who was desperately trying to cross the road. I yelled at Philip to stop. He did. This stopped everyone behind us too. I knew it was too big for me to lift so I asked him to take it across the road. He knows better than to argue with me where animals are concerned. Not that I think he would have. I did tell him to be careful as I have heard that they can bite. Out he got, and crossed to the middle of the road. The cars coming the other way stopped now too....... which was rather fortunate really. Anyway, he picked up the turtle, carried him across to the other side and put him in the grass. The turtle then continued on his way into woods, which were right there. The other motorists didn't cheer him but they didn't honk or shout at him either so they must have thought he was a bit of a hero. I think he is a hero. The turtle would think he was a hero, if turtles could think. A friend of mine, who lives in Michigan, told me he spends a lot of time on "Turtle Patrol" at this time of year. He said he hoped we had taken the turtle in the direction he was heading, which we had, as it is mating time and they know where they want to go. This one looked like he was on a mission and I don't think he was thinking about our Hero Philip. His thoughts were somewhere else entirely. The turtle is a beast !!! !